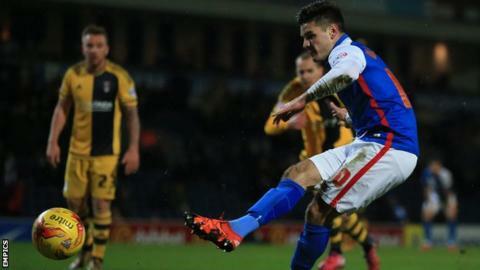 Blackburn ended a nine-match winless run in the Championship with a dominant display against Fulham. The Whites pressed early on and Michael Madl had their best effort cleared off the line by Darragh Lenihan. Rovers were in charge for most of the game and Ben Marshall's jinking run was stopped illegally by Luke Garbutt, who got up to convert the penalty. Shane Duffy headed in following a free-kick and Danny Graham nodded in his first Blackburn goal to secure the win. Rovers, who had gained just four points since 11 December coming into the match, leapfrog Fulham into 18th and are now eight points clear of the relegation places. Boss Paul Lambert was adamant Blackburn could be on the verge of being sucked into a relegation battle if results did not improve, but his side created the better chances. Fulham secured an impressive victory at QPR on Saturday but struggled to impose themselves on the game and have now taken just four points from seven matches. "I always liked the way Danny Graham played the game and there's always a hunger with him. You see his work-rate tonight, everything he gave us. "I thought it was always us, we always looked a threat. It was a massive team performance. "I thought from start to finish we were very, very good and we could have won by more - I thought we looked very good all night." "I say sorry to our fans who travelled to watch this game today because today was nothing special. "We played without spirit, without desire and this is very important to win the game. "We didn't try to play football, we didn't do anything important today - it is a bad sensation." Match ends, Blackburn Rovers 3, Fulham 0. Second Half ends, Blackburn Rovers 3, Fulham 0. Corner, Blackburn Rovers. Conceded by Andy Lonergan. Attempt saved. Simeon Jackson (Blackburn Rovers) left footed shot from the left side of the box is saved in the bottom left corner. Offside, Fulham. Jamie O'Hara tries a through ball, but Dan Burn is caught offside. Michael Madl (Fulham) wins a free kick in the attacking half. Attempt blocked. Tom Cairney (Fulham) left footed shot from outside the box is blocked. Assisted by Moussa Dembele. Attempt blocked. Tom Cairney (Fulham) left footed shot from outside the box is blocked. Assisted by Jamie O'Hara. Moussa Dembele (Fulham) wins a free kick on the right wing. Substitution, Blackburn Rovers. Craig Conway replaces Jordi Gómez. Goal! Blackburn Rovers 3, Fulham 0. Danny Graham (Blackburn Rovers) header from the centre of the box to the bottom left corner. Assisted by Elliott Bennett. Attempt saved. Moussa Dembele (Fulham) left footed shot from the left side of the box is saved in the bottom left corner. Attempt missed. Danny Graham (Blackburn Rovers) left footed shot from the centre of the box is close, but misses to the right. Attempt missed. Chris Brown (Blackburn Rovers) left footed shot from outside the box is high and wide to the left. Assisted by Danny Graham. Offside, Blackburn Rovers. Chris Brown tries a through ball, but Danny Graham is caught offside. Foul by Alexander Kacaniklic (Fulham). Corry Evans (Blackburn Rovers) wins a free kick in the defensive half. Attempt saved. Moussa Dembele (Fulham) right footed shot from outside the box is saved in the bottom right corner. Assisted by Tom Cairney. Attempt missed. Shane Duffy (Blackburn Rovers) right footed shot from outside the box misses to the left. Ross McCormack (Fulham) is shown the yellow card for a bad foul. Offside, Blackburn Rovers. Elliott Bennett tries a through ball, but Danny Graham is caught offside. Substitution, Fulham. Zakaria Labyad replaces Fernando Amorebieta. Delay in match Darragh Lenihan (Blackburn Rovers) because of an injury. Chris Brown (Blackburn Rovers) wins a free kick in the defensive half. Danny Graham (Blackburn Rovers) is shown the yellow card for a bad foul. Goal! Blackburn Rovers 2, Fulham 0. Shane Duffy (Blackburn Rovers) header from the centre of the box to the high centre of the goal. Assisted by Elliott Bennett following a set piece situation.